you may have heard the term 'Momiform' a time or two. it references the words 'Mom' & 'Uniform' combined to make momiform which tends to be a casual style, usually featuring athleisure. while pregnant the momiform has been my go-to style for days where i want to take it easy, stay comfortable and still look put together. these capri pants from Motherhood Maternity are insanely comfortable. they breath well which makes them great for exercise and their fabric is super stretchy and soft. there is a panel that goes over your belly which makes them stay in place. sometimes i am not a fan of the belly panel because it can be too constricting but in this case it is actually quite comfortable. along with the capris the lightweight hoody is also a Motherhood Maternity find. the length is perfect and fits easily over your belly when zipped allowing you to enjoy the comfort of a hoody without the restriction of a zipper pulling too hard across your stomach. one of my favorite handbag styles right now is the backpack. it allows you to be hands free while still looking chic. 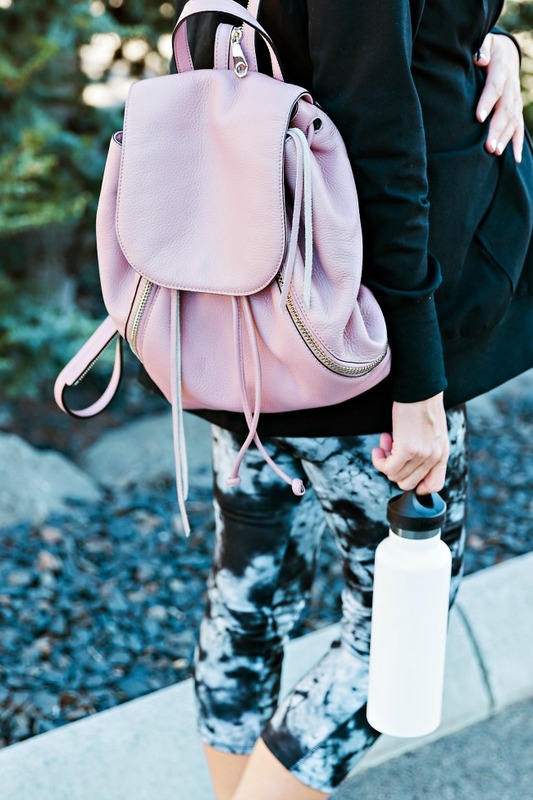 this backpack by Rebecca Minkoff is a great option for pre and post baby. the color of this bag is a favorite of mine. it coordinates well with my favorite color palette which is blush and grey and looks great with my pink Ray-Bans. the backpack is roomy enough to work well as a diaper bag once baby arrives but not too big and bulky for everyday wear. the leather is so soft and wears really well. last but not least you NEED the Nike FlyKnit shoes in your life. they are the most comfortable tennis shoes i have every worn. imagine slippers but with soles. that is a pretty good analogy for how comfortable these tennis shoes are. linked below are each of these items where you can shop the post.